Abstract: That's the sales pitch behind the SuperTalent Luxio, a 64GB USB drive which boasts AES-256 hardware encryption. 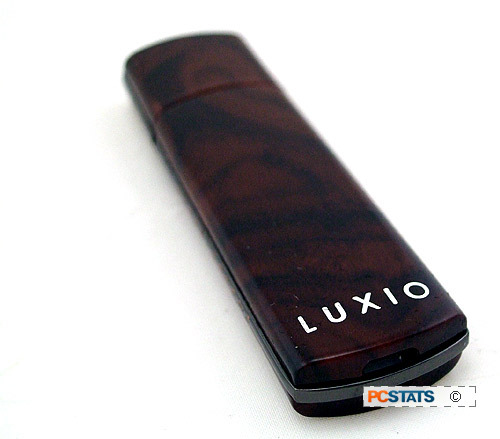 It sounds secure, yet PCSTATS was able to crack the security on the Luxio USB drive W-I-D-E open. Huge USB drive capacities have encouraged users to carry lots data while on the go, and even run software, email clients, or entire operating systems from these tiny little devices which have little or no intrinsic security structure. Generally speaking, whomever holds the USB drive has full and unfettered access to all information it contains. Plug it in, open up a folder and there it is. Recovering lost and accidentally erased data is one thing, but what happens if you loose a 64GB USB drive packed full of confidential details? Encryption is a good answer. It's a security system to make data unreadable to everyone but the rightful owner, so in the event a USB drive is lost at least the data won't be compromised too. That's the sales pitch behind the SuperTalent Luxio, a 64GB USB drive which boasts AES-256 hardware encryption. 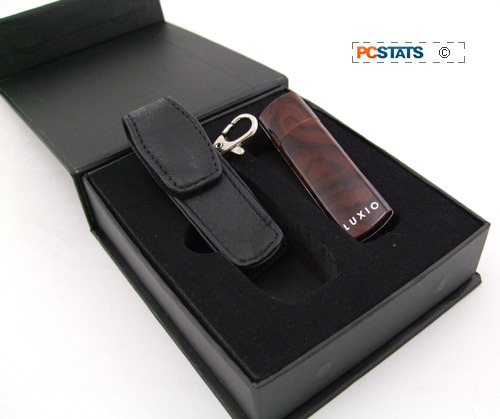 It sounds secure, yet PCSTATS was able to crack the security on the Luxio USB drive W-I-D-E open. In this review we'll explain how you can gain full and unfettered access to the "encrypted" files in about 10 seconds without any special tools, or even a correct password. Supertalent's 64GB Luxio USB drive maintains quick data access rates of about 30MB/s, or 200X, and according to the manufacturer relies on a hardware-based 256-bit Advanced Encryption Standard (AES) algorithm. The hardware encryption works in conjunction with an application called SecureLock to encrypt/decrypt files stored on a specified partition of the USB flash drive, while remaining essentially transparent to the user. The Supertalent Luxio comes pre-loaded with the 2.5MB SecureLock application. 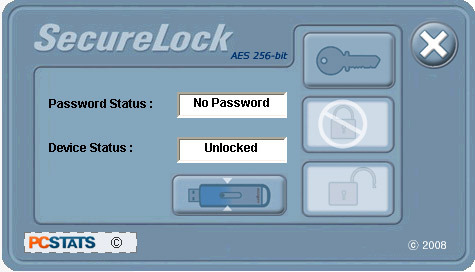 SecureLock allows you to create public and private partitions of any size totalling the capacity of the USB drive. So for example, this 64GB Luxio could be set up with a 50GB encrypted partition and a 14GB public partition. The encrypted partition is password protected and unreadable until the owner runs the SecureLock program and logs in. The public partition is always accessible. In the event of a brute force password hack, the SecureLock software is supposed to automatically format the encrypted partition after 5 failed login attempts. Encrypted data is thus kept inaccessible to whomever attempts to gain unauthorized access, and unfortunately to forgetful owners as well. Sounds good so far except PCSTATS quickly discovered a way around these security measures... we'll go over all of that momentarily. The 64GB SuperTalent Luxio USB flash drive retails for about $140USD ($160CDN) and is covered by a limited life-time warranty from the manufacturer. The SecureLock application is stored on the device along with a copy of the PDF user manual. The drive has a loop for a lanyard though none is supplied, instead Supertalent bundle a small leather carry case to protect the gleaming fake wood grained plastic case from scratches. The Luxio measures 77 x 9 x 21mm in size and has a red LED at one end to indicate data transfer activity. The drive is USB1.1 and USB2.0 compatible, peak transfer rates are 200X, or just under 30MB/s. The drive and encryption software are compatible with all recent Windows 2000/XP/Vista operating systems and can be used for Vista's Readyboost. The encryption tools supplied with SuperTalent's Luxio 64GB USB drive are entirely optional, you don't have to use them if you don't need to. For anyone traveling with upwards of 64GB of data on a USB drive however, encryption should be right up there with travel medial insurance. Don't leave home without it! Before we can secure data on the Supertalent Luxio, we'll need to define a few parameters first. This is accomplished in the same manner as the Kingston DataTraveler Elite that PCSTATS previously reviewed - a 128-bit AES encrypted USB stick, now superceded by the AES-256 DataTraveler Vault series. With the Luxio USB drive plugged into the PC, launch the SecureLock application and assign a password, password hint and set the size of the public and private partitions. The software can partition the Luxio drive in two partitions only, with as much of the 64GB space devoted to the "encrypted" private partition as the user wishes (minimum 10MB partition size). It will then format the entire USB drive for use. The drive should be empty before adjusting partition sizes or setting up encryption as the partitioning process removes all data except for the SecureLock application and PDF user manual. With the encrypted data partition configured, each time the Supertalent Luxio USB drive is connected to a PC the public data storage space is instantly accessible. The data stored in the encrypted private partition remains inaccessible until the SecureLock application is launched and the correct password entered (once a password is set). The user can "log off" the secure partition by launching the program and clicking the lock icon, or simply disconnect the Luxio USB drive from the PC. Each time the USB drive is unplugged from the computer the encrypted partition is automatically locked. The password protection can also be disabled entirely without re-partitioning the entire USB drive should you decide it's no longer required. In the course of testing the Supertalent Luxio 64GB drive PCSTATS discovered no less than four critical programming oversights in the SecureLock software that can allow someone to lock you out of your data or circumvent your password entirely to gain full access to your private data.